The Egg Breaker is a boss that can be encountered at three different locations in Shadow the Hedgehog. It is considered by some fans to be the most irritating boss in the game because of its constant and speedy attacks. Egg Breaker is a robot that Dr. Eggman created and pilots. It looks similar to the Egg Emperor from Sonic Heroes. The mecha is equipped with a spike ball hammer that can be fired from long distances. It can be defeated by attacking the cockpit. Having a weapon proves most useful. Egg Breaker also appears as a boss after the Mad Matrix stage after any mission is completed. Espio the Chameleon is the player's partner. The battle takes place inside a cylinder shaped room with a trail of Rings going around it. There are floating cubes above that have Egg Pawns and jars of Rings on them. The only way to get up there is by using an ascending bar of light. Eggman attacks similar to the way he did at Cryptic Castle. But this time he'll spin and send out bombs while shouting "You know what they say, the more the merrier!". It is considered to be the most difficult of the Egg Breaker's boss battles because the most useful weapons are kept up on top of the blocks, as well as the most annoying as Eggman seems to like using the bomb attack multiple times in a row (constantly shouting the attack phrase each time). Egg Breaker makes its final appearance as a boss after the Iron Jungle stage after any mission is completed. E-123 Omega is the player's partner. 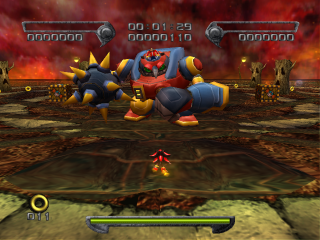 The battle takes place inside Eggman's base; another circular room. There is a platform in the center. Near the outside of the circle, there are two turrets and two rockets. This Egg Breaker battle is vastly different from the previous two. Eggman doesn't engage in hand-to-hand combat with the player as he did before. Instead, he sits on the center platform and fires lasers from the Egg Breaker's eyes. The easiest way to defeat it is by using the turrets. However, the Egg Breaker's lasers will eventually destroy the turret. Another method of attack is using the rockets to get to the Egg Breaker's level. After it gets down to half HP, the Egg Breaker will jump off the platform. It will still fire lasers rather than attacking directly, unless the player gets too close. Despite all of this, it is considered to be the easiest of the Egg Breaker battles because of the absences of the close range attacks. This page was last edited on 31 October 2017, at 18:25.